But first, let's finish up the Sweet Baby lay out. 1)Choose where your pictures will be. I just laid out brown cardstock as place holders, rather than juggle pictures around. 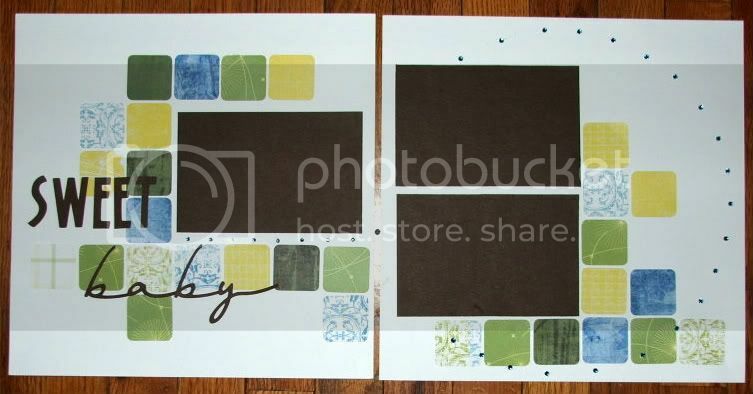 2)Lay out the squares in a pattern around the cardstock. I laid it all out first and then glued it down when I liked how it looked. No rulers, just eye it as best you can. 3)Using Kaisercraft rhinestones in aqua, and a dinner plate as a template, I out a circle around the whole thing. 4)Finally, I cut a title using the Opposites Attract cartridge frfom my Cricut Expression. Voila! hope you like it! I will be designing the classes for April, May and June this weekend..I'll be sure to take pictures of those for posting later this summer.